If you have an affinity for Cajun/Creole cooking, I definitely recommend getting a subscription to Louisiana Cookin’ Magazine. 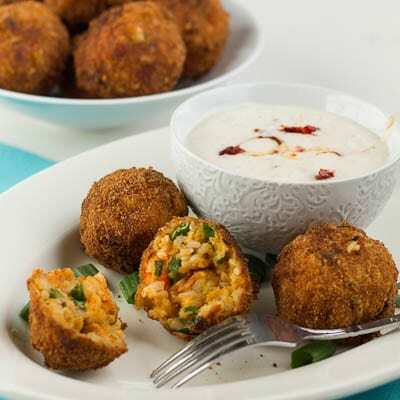 Every issue is full of delicious recipes, both traditional ones, as well as modern takes on the classics such as this recipe for Fried Crawfish Etouffee Balls served with a Chipotle Ranch for dipping. The magazine must be getting pretty popular, because not only do I regularly see it at book stores, but it’s been popping up at my local grocery store too. If you really want to impress your guests at your next party, serve these Crawfish Balls as an appetizer. They can be formed ahead of time and fried up just before serving. They’re super crunchy on the outside, like a crisp hushpuppy, and spicy on the inside. You might want to go easy on the chipotle in the ranch sauce since the balls themselves are spicy. If you don’t have access to crawfish in your area, or don’t care for them, you could easily substitute shrimp. Just be sure to dice them up so they will conform to a ball shape. The Quick Crawfish Etouffee recipe yields 3 cups and only 2 cups are needed for the balls. I’m thinking the leftover cup would make a great omelet filling. In a large bowl, combine Crawfish Etouffee, 1/4 cups bread crumbs, rice, green onion, hot sauce, salt, cayenne, and 2 beaten eggs. Refrigerate for 30 minutes. In a medium bowl, whisk together 2 eggs and milk. Place flour in a second bowl and remaining bread crumbs in a third bowl. 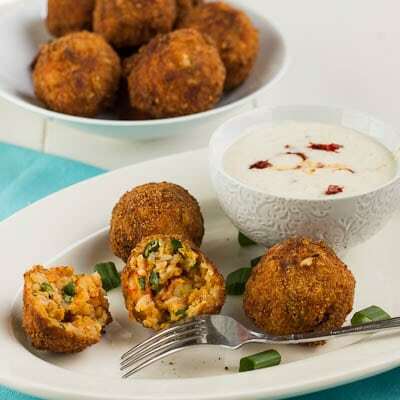 Scoop etouffee mixture into balls the size of a golf ball. 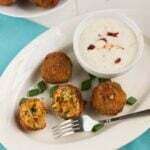 Roll each ball in flour, then egg mixture, and finally the bread crumbs. Place on a baking sheet and refrigerate until firm, at least 2-3 hours and up to 24 hours. To make Chipotle Ranch: In a medium bowl, combine ranch mix, buttermilk, and mayo and whisk until smooth. Stir in chipotle. Melt butter over medium heat in a large pot or Dutch oven. Stir in flour and cook until mixture turns the color of peanut butter, about 10 minutes. Be careful not to burn the roux. Turn heat down if you detect even the faintest scent of burning or feel it is browning too fast. Add onion, celery, and green pepper. Cook until softened, about 5-6 minutes. Stir in crawfish, salt, pepper, and Creole seasoning. Reduce heat to low, cover and cook for 15 minutes. Let cool completely before making balls. This entry was posted in Appetizers and tagged Appetizer, crawfish, etouffee, louisiana cooking. Bookmark the permalink. Just pinned this to my “Seafood” board. and noted that I can use shrimp or crab instead. Oh, the rice looks so good combined with everything else.